Pours: A hazy amber with a touch of rusty red/orange and a minimally persistent off white head. Taste: Burst of citrus and lingering hoppy bitterness followed by a slight off balanced caramel/toasted malt backbone. It's crisp, and almost sweet. Drinkability: A very nice... unique... IPA. Flavorful, refreshing, and crisp. In all honesty I think I like the smell of this beer more than anything else, but I have no reservations about recommending it to anybody. If you're an IPA fan or a hop-head you've probably had better, but if you're looking for something unique give this beer a try. 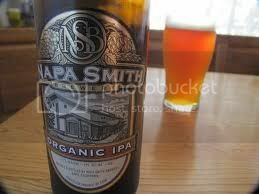 If you're an "organic advocate" then this is the beer for you, as it is probably the best "organic IPA" available... and maybe the best organic beer period. At 9 to 12$ for a 4 pack it is certainly not cheap, but you're paying for quality and craft here, and it is well worth it. This beer would be PERFECT paired with some spicy tex/mex fresh seafood, (specifically with anything that is citrus marinated), and would be fantastic on a hot summer afternoon by the grill.